Simple Present I prefer my coffee black. Present Continuous She is listening the music now. Present Perfect I have already prepared breakfast. Simple Past We watched the news last night. Past Continuous They were studying math yesterday. Past Perfect I went there after I had completed the task. Simple Future You will mary me. Future Continuous I will be loving you. Future Perfect The rain will have stopped by tomorrow. Present Perfect Continuous The mechanic has been repairing our refrigerator. Past Perfect Continuous They had been being friend since childhood. Future Perfect Continuous At 4 o’clock, we will have been waiting you for one hour. Simple Present I do not prefer my coffee black. Present Continuous She is not listening the music now. Present Perfect I have not prepared breakfast yet. Simple Past We did not watch the news last night. Past Continuous They were not studying math yesterday. Past Perfect I had not completed the task. Simple Future You will not mary me. Future Continuous I will not be loving you. Future Perfect The rain will not have stopped by tomorrow. Present Perfect Continuous The mechanic has not been repairing our refrigerator. Past Perfect Continuous He had not been reading a book. Future Perfect Continuous They will not have been going for a picnic. 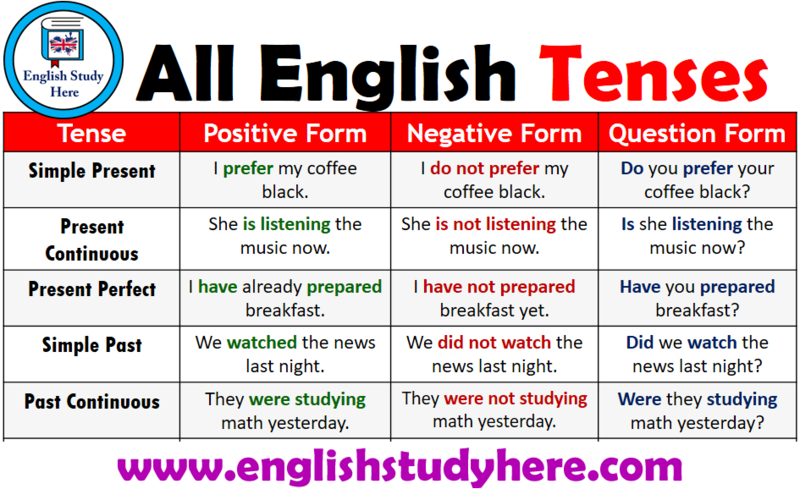 Simple Present Do you prefer your coffee black? Present Continuous Is she listening the music now? 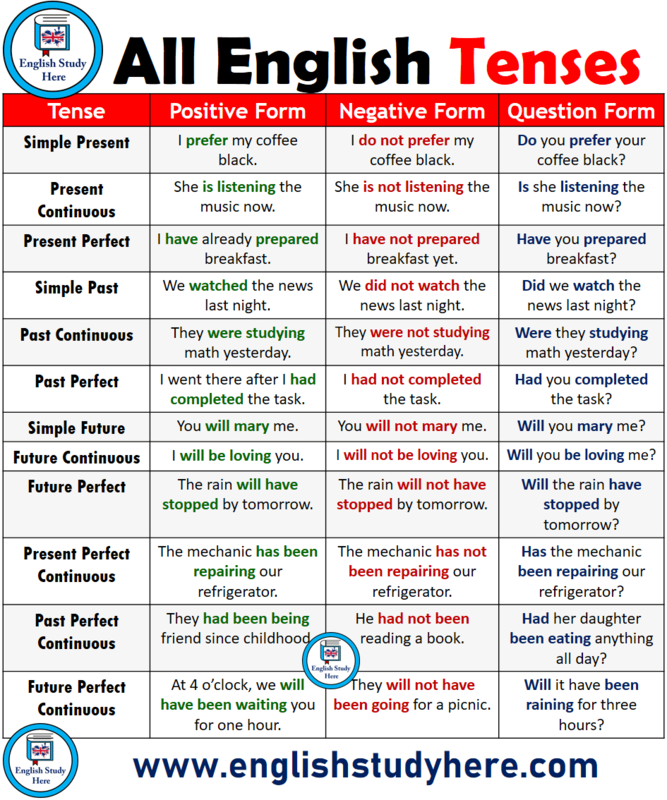 Present Perfect Have you prepared breakfast? Simple Past Did we watch the news last night? Past Continuous Were they studying math yesterday? Past Perfect Had you completed the task? Simple Future Will you mary me? Future Continuous Will you be loving me? Future Perfect Will the rain have stopped by tomorrow? Present Perfect Continuous Has the mechanic been repairing our refrigerator? Past Perfect Continuous Had her daughter been eating anything all day? Future Perfect Continuous Will it have been raining for three hours?